If you own a Kindle, epub files are not possible to read. However, there is an easy way you can convert any epub file to a mobi file, and then you can read it on your Kindle device or app. But first, it is worthwhile understanding how Amazon ebook files work. What are Amazon Kindle ebook file types? The following file extensions can be used to define the variations of Amazon ebook file formats. When you buy ebooks from the Amazon Kindle store, they are in AZW files. The proprietary AWZ file extension perhaps stands for Amazon Word, but no one seems quite sure about this. What is important to know is that AWZ files are a format developed and based on the mobi file format. Amazon acquired Mobipocket in 2005. Mobipocket SA was a French company incorporated in March 2000 that created the .mobi e-book file format and produced the Mobipocket Reader software for mobile phones, personal digital assistants (PDA) and desktop operating systems. AZW files can only be obtained from the Amazon website. AZW3 is another name for KF8. This format first came out for the Kindle Fire. This is the primary format for most current Amazon Kindle devices, but they can also read the other formats. KF8 also has a fixed width layout mode which can be used to convert CBR and CBZ files with a pane view feature. AZW4 is a new version for textbooks (similar to PDF). AZK is a special iOS version for Kindle Reader on Apple products. AZW8 is the extension for KFX which is another special format currently on the Kindle Paperwhite 3, Kindle Oasis, and Kindle Voyage. This is the latest format and has several advanced features. It is being rolled out for all current products. However, all Kindles still supports the use of mobi files. It is the format that Kindle and Kindle app users can use so you can load ebooks from sources other than Amazon or the Amazon Kindle store into your Kindle or app. All you need to do this is to use a mobi converter. Epub is the most widely used ebook file format. It was developed by the International Digital Publishing Forum (IDPF), which is now part of the World Wide Web Consortium and superseded the old Open ebook format (OEB) in 2007. It is an open source ebook file that in some respects could be compared to how .mp3 files became an industry standard for music. The book format can be used with tools such as the EPUBReader Firefox add-on, Adobe Digital Editions and QuickReader. Devices that can open this file include iBooks on an iPhone, iPod Touch or iPad. It can also be used on Sony Readers, Kobo Reader, and the Nook from Barnes & Noble. In fact, the format is an open standard, and .epub books can be used on almost any reading program or device. Except for Kindle ebook readers and the Kindle app. There are many free online converters that work quite well if you simply want to convert one or two ebooks from an epub book to mobi. But if you want to convert ebook formats on a regular basis, or want to create your own library of ebooks, there is a much better way. First, you need to download a free open source program called Calibre. It is available for both Mac and Windows PC. It is an ebook management system that you can use to build your own ebook library that you can save and backup to protect your ebooks. This is good insurance against the possibility, albeit remote, of your Kindle being wiped clean due to “unspecified violations to Amazon’s terms of service”. 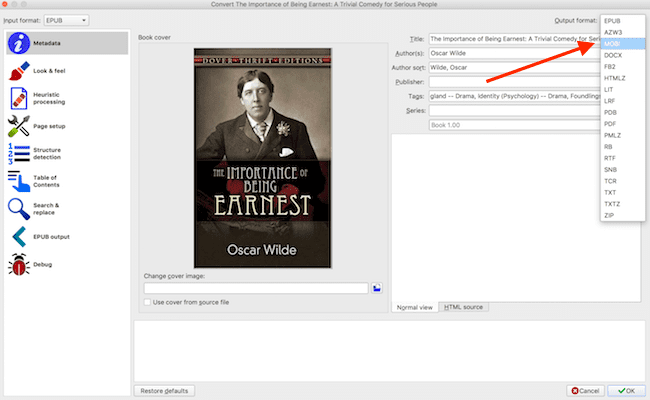 As well as being an excellent ebook file converter, Calibre also has tools that allow you to change or update book covers and to edit the ebook metadata. 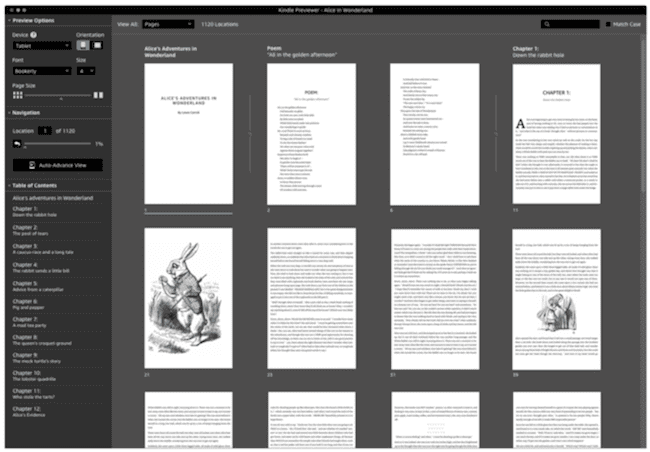 I downloaded an ebook in epub format from Project Gutenberg to use for my example conversion. The first step is to select “Add Book” from the Calibre menu and select the epub files that you want to convert. As you can see, after adding the book, Calibre loads all the information and metadata from the .epub ebook file. You can then click on “Edit Metadata”, or on “Convert Books”. Both will take you to a similar screen where you can fine-tune your ebook before conversion. As you can see, the book cover is terrible, which is often the case with free ebooks. Here is easy to fix. Do a Google image search to locate the original cover. Download it and then click “Change Cover Image”. That is much better. 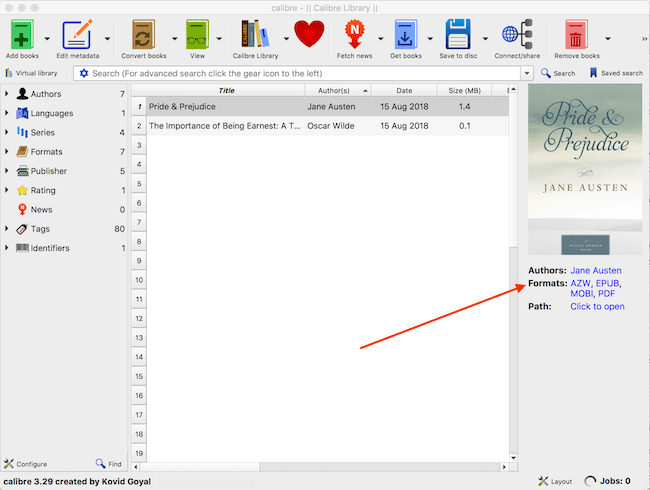 You can also edit the metadata for a book if you want to have a special filing or indexing system for your ebook collection. Now you are ready to automatically convert your ebook from epub to mobi format, which is Kindle format. Select .mobi from the “Output Format” button in the top right-hand corner and then click OK.
You will now have the new .mobi version of your ebook saved to your Calibre library. From there you can load your ebook file to your Kindle or Fire tablets. You can use Send it to your Kindle, your kindle email address or open it with the Kindle app. You can change the location of your Calibre library. So you can choose to save all of your ebooks to your hard drive or to Dropbox, iCloud or OneDrive. You can also work the other way round by using an AZW file to convert to other book formats. First I uploaded a book from my Kindle library. Then I clicked on “Convert Books” and ran three conversions. You can see that I have converted the Amazon AZW file to .epub format, .mobi and you can also create pdf files. Converting to .pdf files can be useful if you want to print out certain sections of a book, perhaps for research for an assignment. Calibre can convert to eighteen different document format file types, including .docx, .txt and .zip. 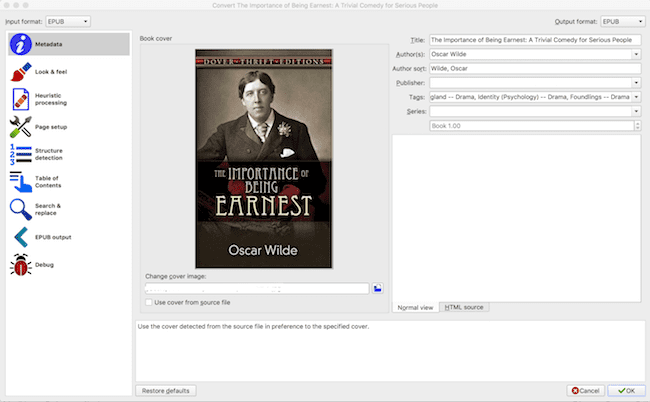 For dedicated ebook readers, Calibre is a tool that can do everything you could possibly think of with your ebook files. Another way you can convert ebook files is to download the free Kindle Previewer program from Amazon. The desktop program is available for Windows and Mac. It is a very handy tool for authors who want to check the quality of a Kindle ebook before publishing on Amazon KDP. But, it also has a useful import and export function that can help you convert an epub file. You can import a whole list of ebook and document file types including kpf, mobi, azw, epub, htm, html, xhtml, opf, prc, azw3, azw8, doc and docx files. However, unlike Calibre, you can only export to mobi or azk files. But if all you need to do is quickly output a mobi file that you can read on your Kindle, it will do the job for you. You can read the Kindle Previewer User Guide for more details. Digital Rights Management (DRM) is used to protect the rights of authors and publishers. It is also used by ebook retailers such as Amazon and Apple to protect their proprietary files. Not all retailers use it, so it is a matter of shopping around for ebooks that are not DRM protected. It is common knowledge that there are tools and ways and means to strip an ebook of DRM. However, I do not condone the practice. DRM is selected and set by self-publishing authors and small publishers to protect their work. It is not only a tool used by big publishers and retailers trying to keep you locked in their walled gardens. If you are a Kindle lover, being able to convert .epub to .mobi will give you access to a lot of books that you cannot currently read on your device. Using Calibre also gives you the option to have your own ebook library that you can backup and save. 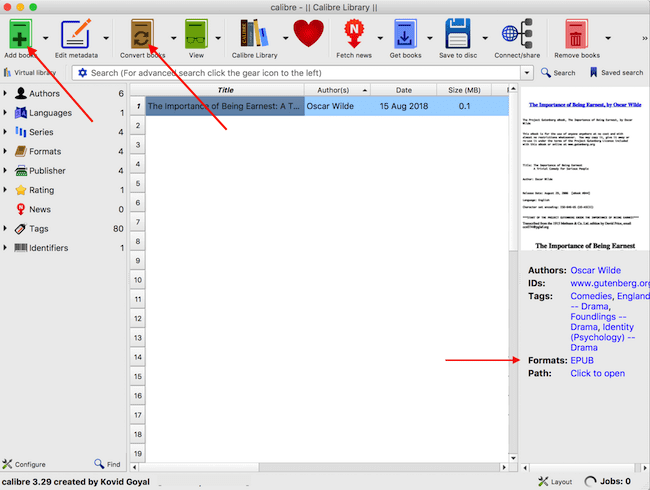 For authors, Calibre is a must have tool. 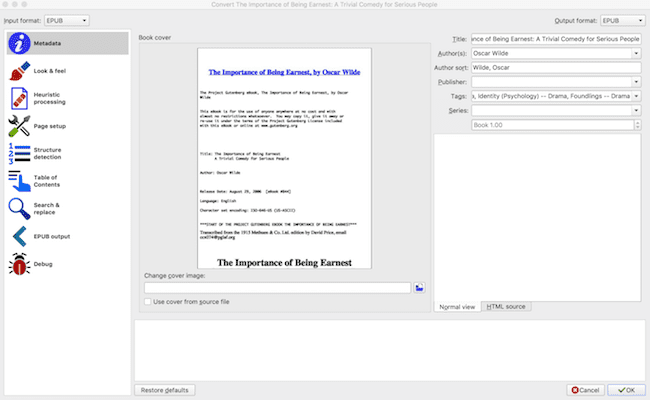 In an earlier article, I explained how to convert Word docx files to epub and mobi formats. For anything to do with digital books, for readers and writers, Calibre is the best way to convert, edit and save your files. Perfect timing, I’m preparing an ebook to upload to Amazon, and am using Adobe ID (In Design) to format for both paperback and digital. However I learned the software doesn’t export to the Kindle mobi format, and the Kindle app to convert files didn’t recognize my software during download (perhaps because I’m using a cloud edition?) But your post provides a way for me to easily convert epub to mobi, so I can upload my finalized file to Amazon. My first time doing this, appreciate knowing there is a solution before I dive into formatting my book on Adobe ID.